The City of Stuart, Stuart Main Street, and the Downtown Business Association of Stuart invite you to celebrate Historic Downtown Stuart’s fresh new look. There will be a ribbon cutting, reception, and FREE concert presented by Earthtones with PASSAFIRE and special guest The Bryce Allyn Band. 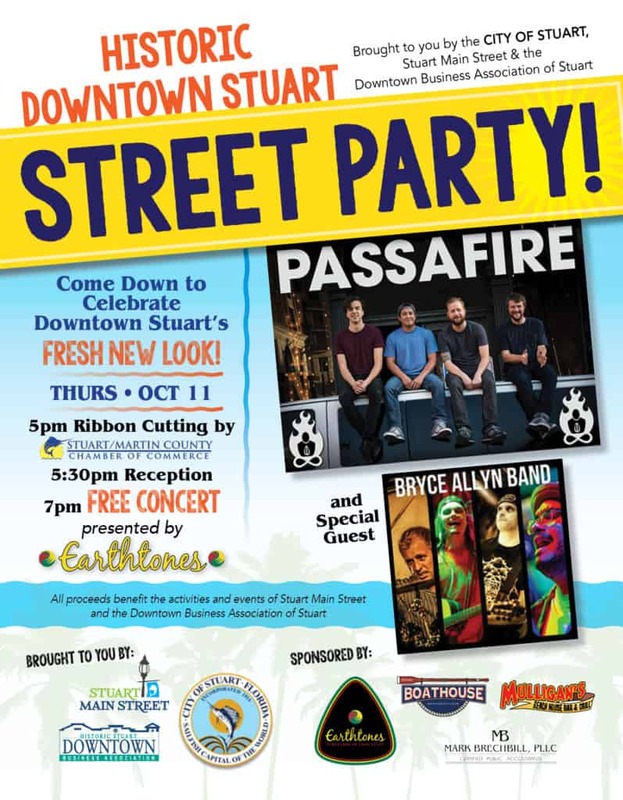 Join us at 5:00 for a Business After Hours and ribbon cutting with the Stuart/Martin County Chamber of Commerce, followed by a concert with The Bryce Allyn Band at 7:00 and PASSAFIRE at 8:30. This event is FREE. Any proceeds benefit the programs of Stuart Main Street and the Downtown Business Association, including the Rock’n Riverwalk FREE waterfront concert series. Singer Bryce Allyn gained his early momentum fronting the stellar south florida band Boxelder. His endless message of spiritual love and awareness has gained him an prolific following over a 20 year span. Insightful lyrics along side a passionate delivery have garnered his fans acceptance better than any South Florida artist to date.